Welcome to my blog “Evolution or Revolution.” The topics to be discussed here will focus on the world of emerging media. I invite visitors to share your thoughts and look forward to hearing your ideas about emerging media. Please also feel free to share how emerging media impacts your daily life and what types of emerging media you currently are using. Emerging media is difficult to define; however, in its simplest form, it “is communications – of all types – based on digital technologies, and increasingly with interactive components” (Weebly.com, 2015). To me, emerging media is always at our fingertips and is transformational. There is no fluidity to this type of media because what may work one day could be changed the next with just a touch to the keypad. Emerging media impacts our lives on a daily basis. We go from Facebook to Twitter to LinkedIn to a variety of other media available to keep us connected. 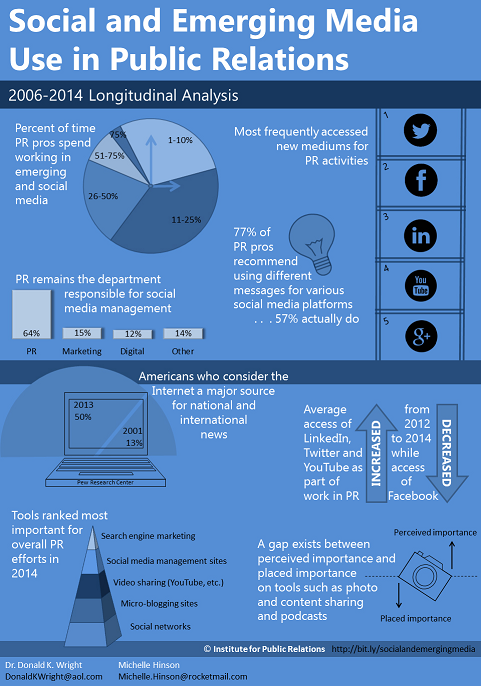 In the world of PR (which is where I live in my job), the infographic below gives a clear picture of how much time we spend daily in this world. I expect that these numbers will continue to increase over the next several years, especially the amount of time spent working in emerging and social media. I love the graphic that serves as my blog featured image. While it’s a graphic of the evolution of the web, for me, it’s also how I imagine emerging media looking if it were diagramed, a mix of complex twists and turns with lots of “interconnected elements” (Bing, 2015). So, let’s follow some of these twists and turns over the next eight weeks and see where they take us on this journey into the world of emerging media.